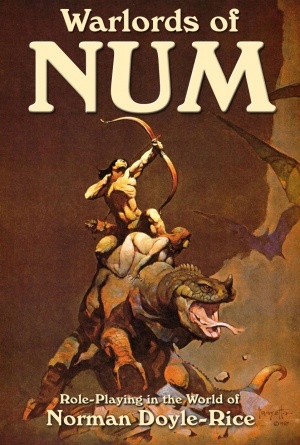 Warlords of NUM ("NUM" rhymes with "doom") is based on the classic series of fantasy adventure books by Norman Doyle-Rice. From the first in the series, Beast Men of NUM, to his last novel (finished after Doyle-Rice's death by his biographer and close friend, September Bereft), Witch Kings of NUM, Norman Doyle-Rice entertained and enthralled readers with over 100 novels spanning nearly 60 years. We hope that this role-playing game adaptation pleases the many fans of Norman Doyle-Rice, and that we live up to the legend that is NUM. We also hope that, through the NUM role-playing game, new readers who have not yet had the pleasure of reading Doyle-Rice will discover the NUM novels like a long-buried treasure in the Cities of the Dead, and the legacy of NUM will be spread to a new generation of readers. This page was last edited on 4 October 2016, at 20:45.